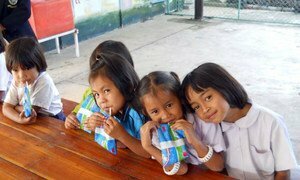 Laos: nutritious meals are bringing more children to school. Urgent action is needed to tackle malnutrition and promote consumption of healthier foods in the Asia-Pacific region – home to most of the world’s undernourished people – the United Nations food security agency said Friday. “Good nutrition depends on raising awareness about healthy foods and choices, as well as efficient, affordable and sustainable systems to deliver that food,” said Kundhavi Kadiresan, the head of the UN Food and Agriculture Organization (FAO) in the Asia-Pacific region, announcing findings from the agency’s regional report on food security and nutrition. The FAO report, 2017 Regional Overview of Food Security and Nutrition has revealed that while food security has improved for millions of people in Asia and the Pacific, hunger and malnutrition appear to be rising in some areas, leaving roughly half-a-billion people undernourished. The situation is particularly dire for children below five, with one in four children suffering from stunting – impaired growth and development, often as a result of poor nutrition. At the same time, report also found that obesity is on the rise, with “significant increases” in the prevalence of overweight children over the past 15 years, especially in South Asia (from three per cent to seven per cent) and Oceania (five per cent to nearly 10 per cent). The report was released Friday at a regional symposium on sustainable food systems in Bangkok, the capital of Thailand. Organized by FAO, in collaboration with the World Food Programme (WFP), World Health Organization (WHO), UN Children’s Fund (UNICEF) and the World Bank, the symposium focuses on policies that can improve food systems, and promote better nutrition and healthier diets. The event was opened by the FAO Special Goodwill Ambassador for Zero Hunger in the region, Princess Maha Chakri Sirindhorn of Thailand, who urged participants to work together to find solutions. “The world has committed to zero hunger and improving nutrition as a key outcome of the 2030 Agenda for Sustainable Development. We must look at improving our current systems of production and patterns of consumption, and set a course of action,” she said. The symposium is a component of the UN Decade of Action on Nutrition 2016-2025, which aims to increase investments and actions to improve people’s diets and nutrition. The United Nations Food and Agriculture Organization (FAO) today launched a report that outlines declining progress towards defeating hunger in Asia and the Pacific, noting that nearly one-in-three children suffer from stunting, and warning that to meet the Sustainable Development Goal (SDG) of zero hunger by 2030, the region must redouble its efforts.